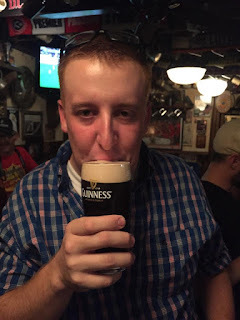 The Ramblings of an Endurance Junkie: World Road Racing Championships 2015 - Richmond! World Road Racing Championships 2015 - Richmond! 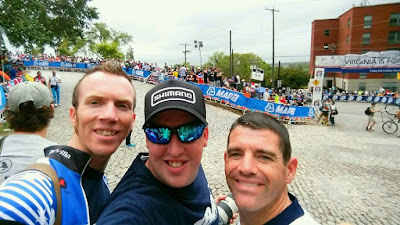 After four years of waiting, the pinnacle of the World Cycling season came to Richmond, VA and boy it didn't disappoint! Although being down there the whole week would have been great, we headed down on the final weekend to watch the Elite Women and Men's road races on Saturday and Sunday. First on Friday night we watched the Brompton World Championships run over a full lap of the 10mile course...yes the rules are you have to wear a jacket, shirt and tie! It was then onto the ABRT World's Happy Hour held at the Penny Lane Pub.....the Happy Hour lasted a bit more than an hour! On Saturday we headed out to watch the Elite Women's race and Lizzie Armistead's win for Team GB! Watching the women's race gave us the low-down on the course and where we wanted to watch throughout the 6hrs of the men's race on Sunday. And it was an awesome race as well! If Richmond was crowded on Saturday then it was rammed on Sunday for the Elite Men's race. The course in downtown Richmond was almost perfect for spectating though. A 10 mile course with so many twists and turns that you could get to all parts of the course within an easy walk (or ride) and never miss any of the action. For cycling fans it was a whose who of World Cycling, as you would expect at the World Championships but of all the one-day classic specialists no-one was missing! 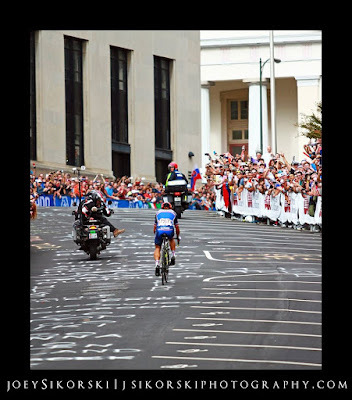 Seeing the Blue Belgian train (including Tom Boonen, Philippe Gilbert et al) hit the cobbles of Libby Hill was an awesome sight to see.....but to be on Governor Hill as Peter Sagan kept the chase at bay with a 1km to go was unbelievable! Richmond did the US proud and I can only think that the crowds and atmosphere was beyond the UCI's wildest dreams. Let's hope that it isn't another 30 years before the World Championships come back to the US! Sagan on his way to victory!